Weather in the Midwest is always interesting. From raging storms in the summer to frigid temperatures in the winter. These last two summers have accrued a large amount of flooding. We've had storms that had lasted for days, leaving homeowners helpless. Unfortunately, some damage remains unseen until weeks or even months later when spots on the drywall, ceiling or paneling start to appear. Mold can easily grow and spread in wet humid temperatures. Especially in homes where water damage had occurred. It does take a professional to properly remove it without spreading the spores throughout the rest of the home. What you see growing on your walls is just the secretion of mold. Using bleach discolors the secretion making you think that it had been removed, but instead it can actually cause the mold to spread. Please consult a professional before you decide to take matters into your own hands. If you have any questions we would be more than happy to assist! Water damage caused by a dish-washer on the floor above. Most everyone knows how a dish-washer works. You place the dishes, include the little packet, shut the door, press a few buttons, and suddenly it roars to life and the dishes are getting cleaned. Yay! What happens when you leave, come back, and realize that instead of washing the dishes, the "so-called" dish-washer ended up attempting to wash the floor in your kitchen? Well, you have quickly mopped it up, placed a 'do not use' sign on the washer, and start prepping to buy a new one. Within a few days you realize that the vinyl flooring in your kitchen is no longer flat. There are some weird places where it bubbles or feels squishy. Bad news: You have water damage under your flooring. Good news: SERVPRO of Rockford can come in and help you out with this problem. Making it "Like it never even happend." So give us a call when an appliance, that uses water, decides to cough it back up into your home! Hurray! Winter is over and now you want to get some yard work done, but wait, as you turn on your outside spigot you realize that water is flowing INSIDE instead of OUTSIDE. 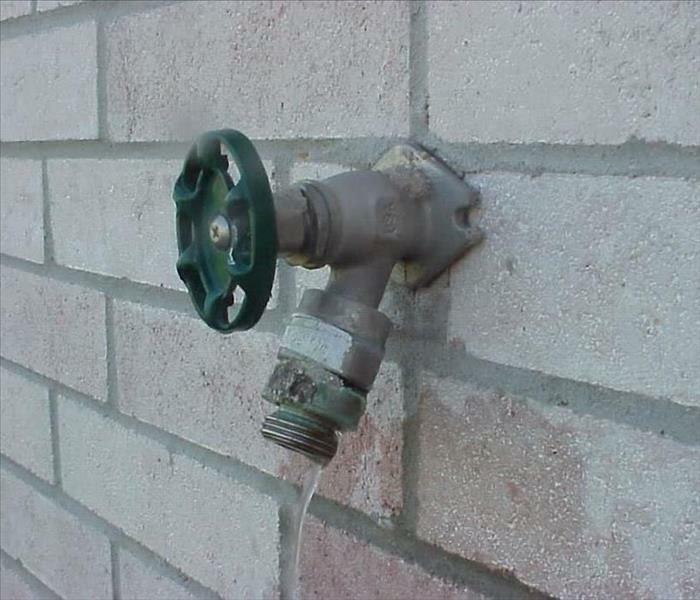 During the winter the spigot could have broken during the freezing temperatures. Immediately shut it off and call a plumber, or worst case, call and plumber and then call us at SERVPRO of Rockford! This is the time of year where we get many calls concerning spigots, either ones that have been leaking awhile, or some that just decided to flood your basement right now. If you do turn on your spigot and nothing goes wrong, don't forget to turn it back off again! It's alright to water your newly created garden, but you also don't want to water your newly finished basement as well! No one likes to hear the word mold when describing their homes. Most people don't even want to think about it. I hate to break it to you, but mold is found everywhere in the world. It is just the elevation you should be worried about. One place you might not think about is your vehicle. In the picture you see a steering wheel with many colorful blotches covering it. This vehicle was out in the rain with the windows down during a rainstorm. When it had been brought back into the garage they rolled the windows up and let it sit, causing a 'Petri-Dish' affect. Throughout the vehicle there was mold growth on the seats belts, seats, and of course the steering wheel. If you do get water in your vehicle make sure that it is properly dried out, unless you like the furry colored splotches. SERVPRO of Rockford's technicians were able to get this vehicle cleaned up and ready for use! So give us a call if anything like this happens to you! 7/19/2018 - Dangers of Dish-washing!